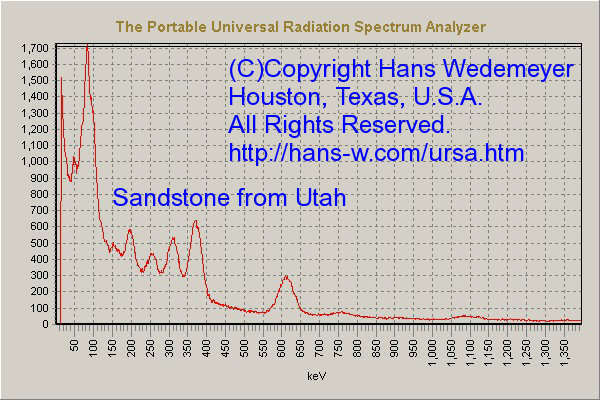 The Portable Universal Radiation Spectrum Analyzer. Front view, battery compartment removed. Page under construction: Please check back often as new items are constantly being added. 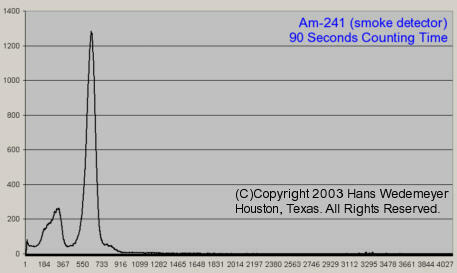 Update: Hardware counter tests show this new CPU can indeed count in excess of 30 (thirty) million counts per minute. Click for details. Update: Optional Extra memory board expands autonomous operation enabling 48 full 32 bit spectra to be stored. Click for details. Low noise design, good low end resolution. Fast response for short counting times. Onboard 256K Byte memory for storage of 4096 channel spectra.16 full spectra with 32 bit count per channel. New ! Optional Extra Memory board will soon be available, boosting memory by 512K Bytes to total of 768K Bytes, enough to store 48 full 32 bit count spectra. Analog threshold (discriminator) full range. 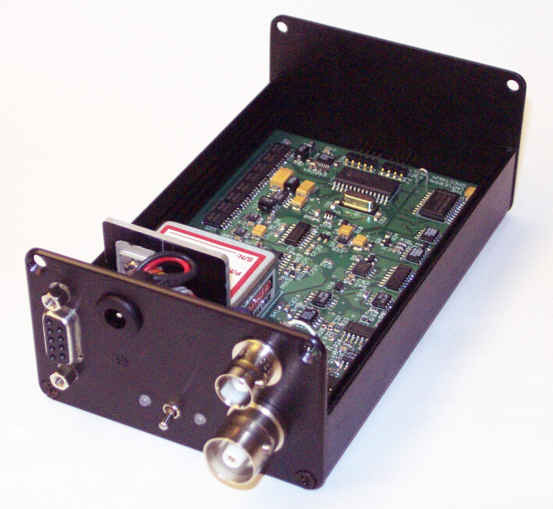 4096 channel fast ADC, very good linear response. Update: Hardware counters are able to handle high count rates of 30+ million counts per minute. Dual or single connector, works with almost any detector. High voltage (bias) range up to 2000 Volts @ 0.5mA. Update: High Speed RS-232 connection, 115200, 230,400, and 460,800 Baud. Long Battery Life (20+ hours using NiMH cells). 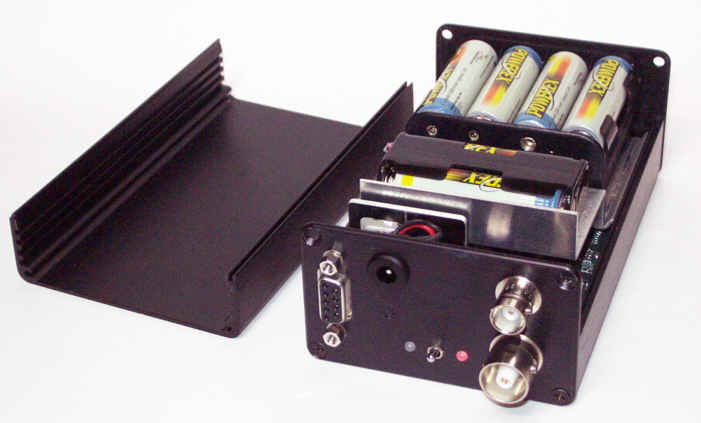 Built in fully automatic (temperature, slope and time) NiMH battery charger. External power supply / charger included. Compact design, all front panel access. This new design is base upon years of experience gained from previous very successful design. Software included at no extra charge. 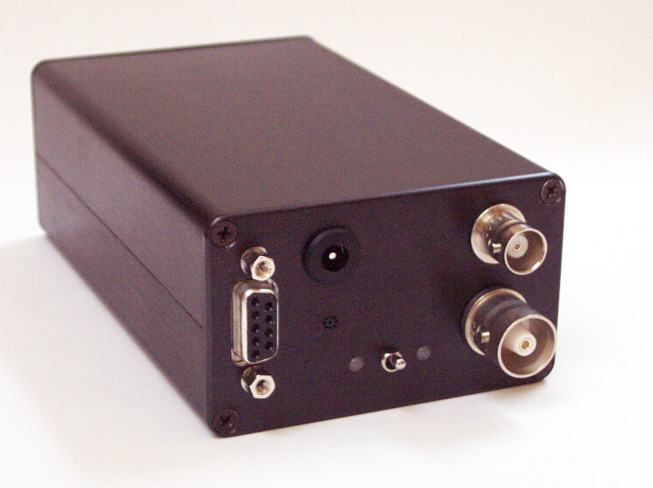 Stand alone TCP/IP network version for single detector or array configurations will be available soon. The New version of this Portable Universal Radiation Spectrum Analyzer has many advanced features based upon the experience I gained from the original design. The signal to noise ratio is significantly higher and therefore reduces count time as well as allowing a better low end range, high end range is of course as good as ever. The lower noise allows much higher gains to be used. The microcontroller speed has been increased by 55%, this reduces dead time and the overall counting times are far shorter than that of the older design. 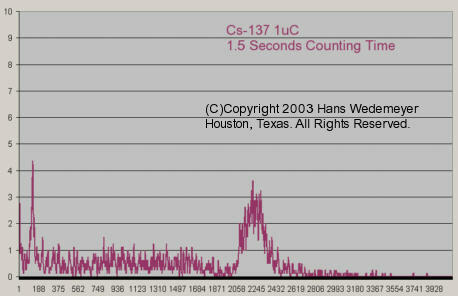 A one micro-curie Cs-137 source can produce a fully quantifiable spectrum in less than two seconds! 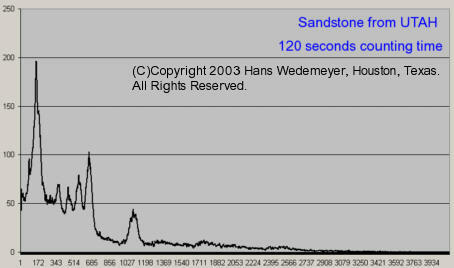 This high speed response makes it ideal for portal and site monitoring. In addition, the lower noise level allows the detection of peaks at the very low end of the spectrum. The original unit came in a small handy box, I decided to retain the original size, and add many new features by using more modern miniature components. My original URSA(tm) (tm registered to Paul Steinmeyer of RSA Inc.) used AC, DC, or battery power and could operate to full specification for about 30 Hours from one set of alkaline batteries. In this new design I decided to incorporate a battery of NiMH cells, and provide a built in, fully automatic charger. My new design runs for about 22 hours from a fully charged set of NiMH batteries, that gives the user two full 8+ hour days of use without the need to recharge. Of course NiMH can be "topped up" at any time and do not exhibit the chemical memory problems associated with Nickel Cadmium cells. The unit will fast charge automatically with full temperature, slope, and time monitoring of the charging process. If the cells are too cold, Fast Charge will be held back until the cells reach room temperature; this ensures reliable and fully automatic charging for the NiMH cells. With such an excellent battery life I decided not to bother with allowing the use of alkaline cells, it simply is not needed. The front panel has two connectors, one BNC and the other a high voltage connector SHVC or "C type" . The "two connector feature" is a migration from the old version which was known as type SC. However the old SC version was a retrofit which is not the case in this new design. The purpose is to allow almost any type detector to be used. External Power +12Volts is made available on the front panel connector, with enough power to run fine detectors such as the Spear CZT. A major new feature is the ability to store 24 full spectra in memory allowing the unit to operate autonomously, and does not need to be connected to a PC. The old design had a modem feature and that feature has further been improved upon in this new design..
By simply adding a good Hayes compatible modem it is now possible to do remote site monitoring with the only requirements being the access to power (solar is OK) and a phone line ( I'm working on a cell phone interface). 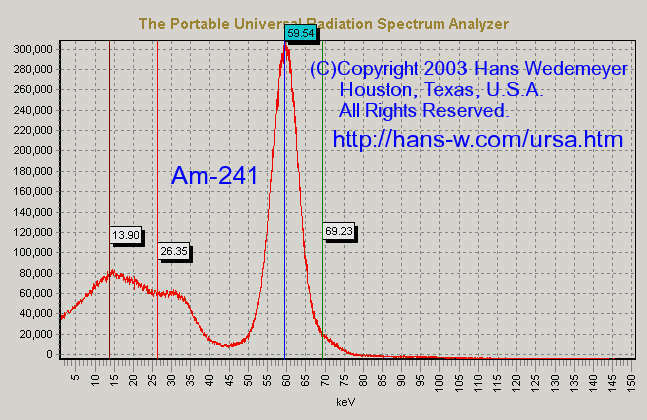 The Portable Universal Radiation Spectrum Analyzer can be fully controlled, and operated by a modem connection. It can also be setup to run autonomously and store a total of 16 spectra for 24 hours (48 spectra with optional memory card). Each spectrum has a full BIN count of 4096 values, each BIN stores a 32 bit value, allowing a maximum count value 4,294,967,295 for each BIN. Of course with a direct PC connection the number of spectra that can be saved is virtually limitless. Spectra are stored in 256K BYTES of NON Volatile memory (does NOT require battery backup). This is NOT using EEPROM(flash) which has a limitation in the number of times a location can be written to and would not be reliable for this application. The memory used has a guaranteed ability to read and write any location up to 10 BILLION times before a memory location becomes impaired, while EEPROM(flash) has a typical 1 million writes (unlimited reads) per location before memory is impaired. In the case of remote site monitoring. 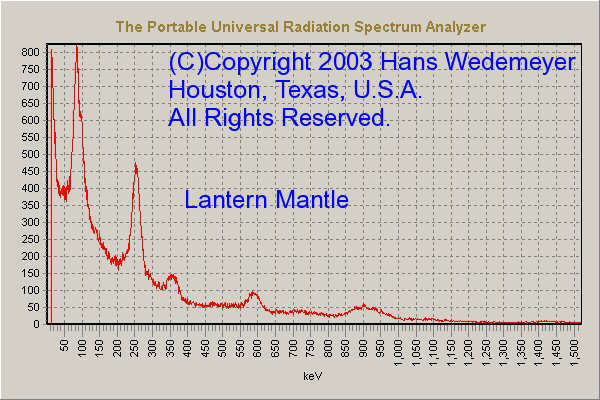 The Portable Universal Radiation Spectrum Analyzer can be called up and all 21 spectra can be transferred in one session. Currently under development is a new feature which will allow the The Portable Universal Radiation Spectrum Analyzer to be configured to monitor several ROI's and if any exceed the count threshold of CPM the unit will dial up a phone number a to report a warning, or drive any external device directly. On calling the preset number it will attempt to connect (by modem) to a dedicated PC and upload the spectra and warning messages. 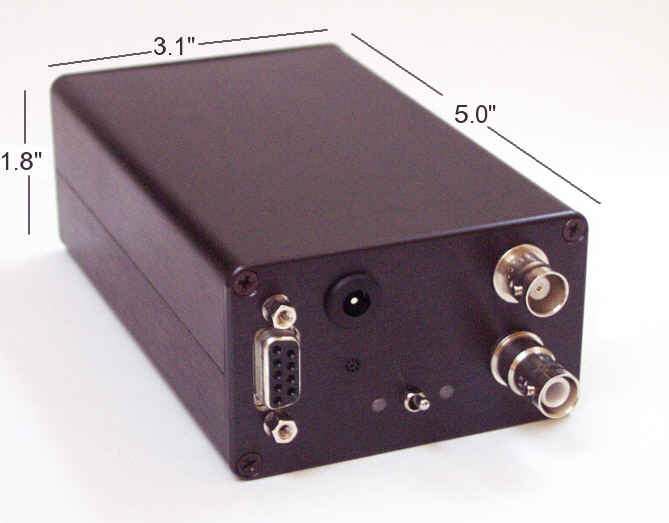 The stationary version has the ability to connect to any FTP server, and transfer the stored spectra as well as issue warning in a fully unattended mode. The stationary version is currently under development and should be ready some time this fall. More details about this version later ! Analog to Digital Converter: 12 bit high speed Analog Digital Converter (ADC) providing 4096 channels. Analog Threshold: The software controlled threshold (discriminator) is adjustable in 500uV steps. Digital thresholds. Software controlled High and Low digital thresholds allow the exclusion of high noise level signals, effectively creating a digitally gated window. This is a handy feature when using a very high amplifier gain settings, which may cause the signal to saturate at the top of the ADC range. By gating this out the RS-232 bandwidth is reserved for transmitting measurement which are within the gate. Pulses rejected or outside of the digital window are reported and can be used to calculate dead time. Signal Shaping: Software controlled shaping in four steps 0.5uS to 4uS. The old unit uses about 0.8uSec and I've found this to be the best for normal everyday usage. Direct input connector (BNC): Preamplifier signals applied to this input are not shaped. The connection can be AC or DC coupled. If DC coupled, any input DC level should be near zero volts. The Gain control can still be used. Input Signal Polarity: for either connector may be positive or negative, the choice is software controlled. (Update)Hardware counters: The built in counters can handle count rates up to 500,000 counts per second, about 30+ million counts per minute ! Of course at this high count rate the unit cannot be expected to measure the amplitude of each and every pulse, no portable MCA can do that!. Previous specification for the hardware counter was based upon the old design, more recent tests using a count simulator (I don't have sources that hot !) 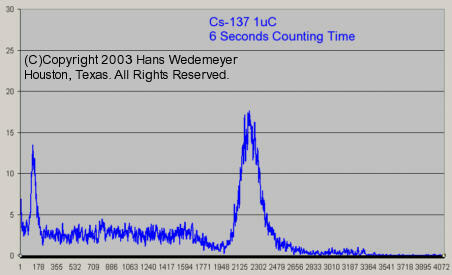 show the hardware can indeed accurately count signals up to 513,000 pulses per second or 30,780,000 pulses per minute. Memory: On board 256K bytes of Non-volatile (no battery power needed) memory is used to store up to 16 full 32 bit spectra. NEW ! Optional Extra Memory board will soon be available boosting memory by 512K Bytes to total of 768K Bytes, enough to store 48 full 32 bit count spectra. In autonomous mode it will be possible to store a full spectrum every hour for 2 days. Front panel High Voltage connector. can be SHVC, C type, or specified the customer. If you have a special connector and can send me a sample of it, providing there is space on the front panel, I will machine the front panel to suit your connector at no extra charge. When adding a connector of your choice, you will forfeit the choice of normal connector. This has to be agreed upon at the time of ordering, and you must supply your special connector without delay and at your cost. After the fact changes can be done, but I will have to charge for the work involved. RS-232 connector: One 9 pin RS-232 connector. The connector is wired so that it can be connected directly to a PC, yet it is also wired to supply +12 V (+-0.5V @ 150mA MAX) and -9V(@ 20mA MAX) for powering external preamplifiers. It is important that the external device using this DC voltage is not a source of noise. Noise injected by any external device can degrade the performance of the analyzer. The old unit in the SC version works well with the Spear CZT detector. Connection Speed: MCA to PC RS-232 connection speed can be 115,200, 230,400 or 460,800 Baud. A good speed for USB adapters is 460,800 Baud. MCA to Modem connection speed preset to 115,200 Baud, actual Modem Line speed will depend upon the quality of the modem used, and the phone line. External Alarm Outputs: There are two connections (open drain) which can activate any external hardware device when an alarm condition occurs. The open drain connection allows any logic level to in interfaces to, not just TTL. 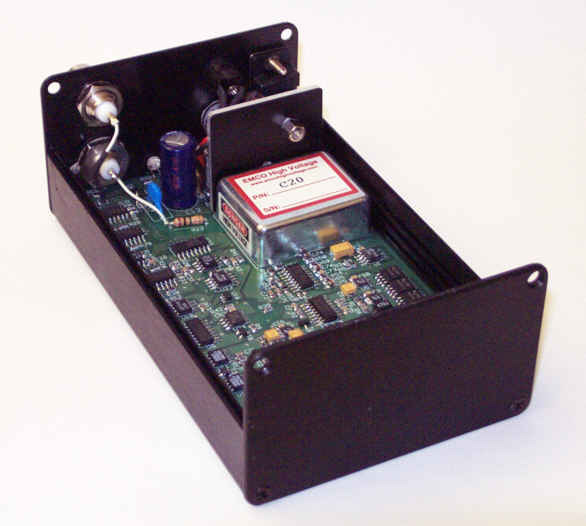 The open drain connection can even drive DC relays directly which in turn can drive any other external device, bell's, horns, strobes, radio transmitters, tcp/ip interfaces, or another computer controlled device. the sky's the limit. External Controls: There is only one front panel manual control, the On/Off switch. Battery charging:. It is fully automatic with temperature and time monitoring. Fast charge cannot happen if the batteries are too cold. Expect about 22 hours of constant usage from a fully charge set of batteries. 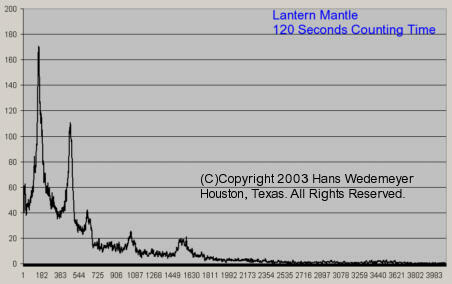 This figure is based upon my experience with the Ludlum Model 44-20 3" X 3" NaI(Tl) gamma scintillator biased to 950 Volts. I think it's safe to expect about two full 8 hour working days from one charge. Remember NiMH can be topped up, unlike Nickel Cadmium they do not have the chemical memory effect. Fast charge time about 3-4 hours. Front panel Indicators: There are two front panel Bi-Color LED's. One indicates when FAST CHARGE (automatic) is enabled (Red) and turns Green when the battery is fully charged. The second LED has two functions. Steady Green indicates the unit is switched ON, and flashes Yellow (GREEN and RED) to indicates signal or random background noise..
Sound: Is standard. Sound On/Off is software controlled. The speaker is mounted behind the front panel (up and left of the On/Off Switch), and when enabled will "tick" with the classic sound we all expect from a survey meter. Sound signals are hardware driven by pulse stretching the actual signal, so it is directly related to the signal/count rate. If needed I can mount a 3.5mm Jack for headphone access at a small extra charge if requested at ordering time ( It requires machining of the front panel and wiring of the jack). If you decide to add this option at a later date, there will be a somewhat higher charge for retrofitting the jack. I strongly recommend a headset with built in volume control, simply because there is no way to control the volume of the sound level. 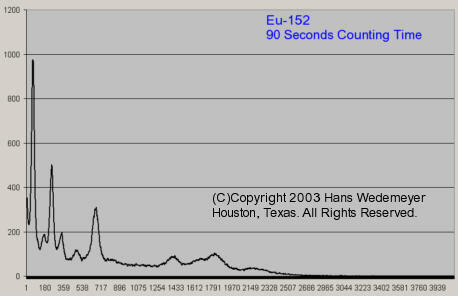 Excellent example of Eu-152 spectrum, and it only needed 90 seconds of counting time. Using higher gain to expand the lower channels, this is made possible because of the excellent low noise figure the unit has. Typically when a higher gain is used the noise will swamp the signal and a much longer count time will be required to get a similar spectrum. Lantern mantle. Count time 900 Seconds. Sandstone from Utah. Count time 900 Seconds. Old Data. Typical JAMCA response for Am-241. Notice the 32keV peak if well defined and not jammed against the left side of the spectrum. This is a direct result of the very low noise design. 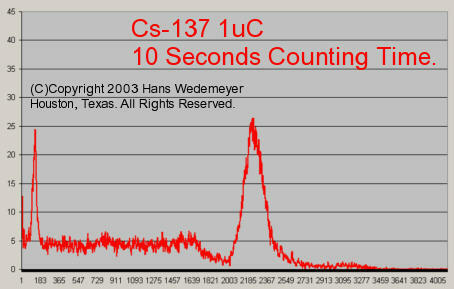 Only 10 seconds counting time and a beautiful Cs-137 spectrum ! 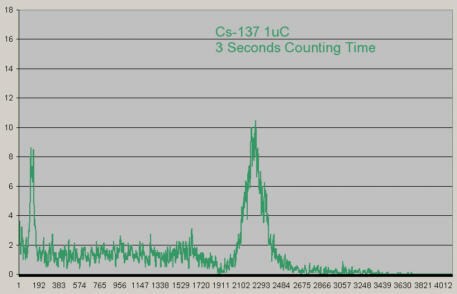 In a situation where high speed computer identification of a spectrum is needed, the quality of this FAST ( 1.5 Seconds) spectrum would be ample to achieve that goal. Super Low Noise Design: It is a known fact that NaI(Tl) Gamma Scintillators have a problem resolving the low end of the spectrum, by studying other designs I concluded it was not only the detector that caused a problem at the low end of the spectrum, in fact many MCA's are so electrically noisy they tend to swamp the low end of the spectrum with system noise, and blame the poor resolution on the detector. With this in mind I designed The Portable Universal Radiation Spectrum Analyzer to have as little system noise as possible. The benefit can be seen in these two examples of the same spectrum. The blue circle outlines an area of interest at the low end of the spectrum. As can be seen the 32 keV peak is well off of the left side of the spectrum, and there are data to the left of it.. With such low noise, it is now possible to apply an expansion factor to the low end of the spectrum and make use of it. You may notice a difference in these two spectrum images.... They are from the new program. Click here to view screen shots of the new program. 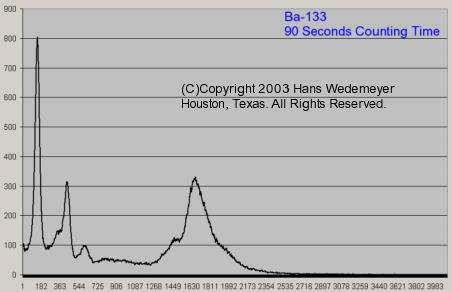 (C) Copyright 2005 Hans Wedemeyer, Houston, Texas, U.S.A. All Rights Reserved.